Dark leaves and in good sized pieces. They are clearly scented with a certain "ash"-like character. This is fairly unorthodox tea. It's orange, and then opens with a long, spicy, smoky aroma - very long, in fact. The flavour is the really curious aspect: it is grainy, rather like a Chinese sweet potato. Lively on the lips, it leaves them buzzing and coated in tea-oil. 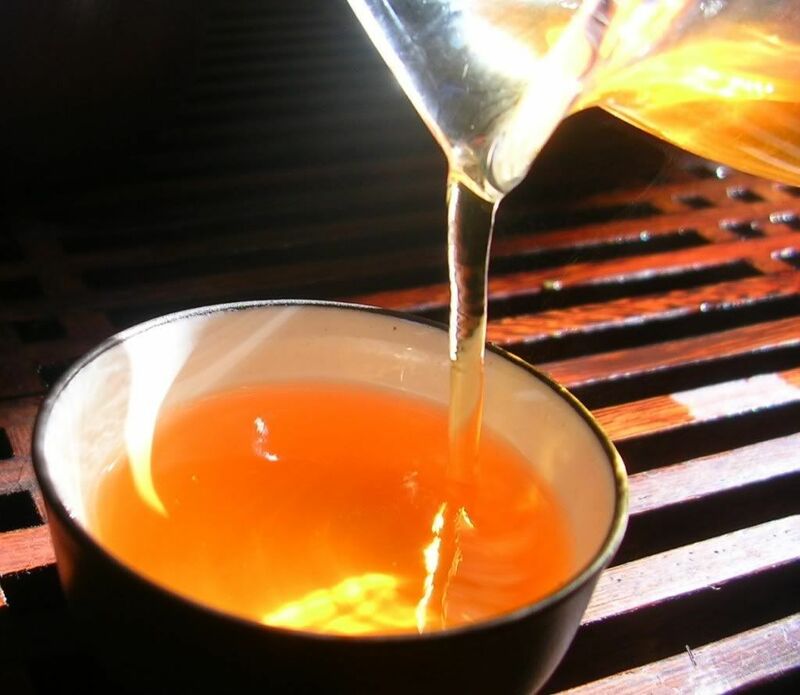 Then, the tea makes a rapid sprint for the throat, with a huigan that promotes excessive mouth-watering. "An asparagus aroma - very fresh, very enjoyable." This tea is so very active! 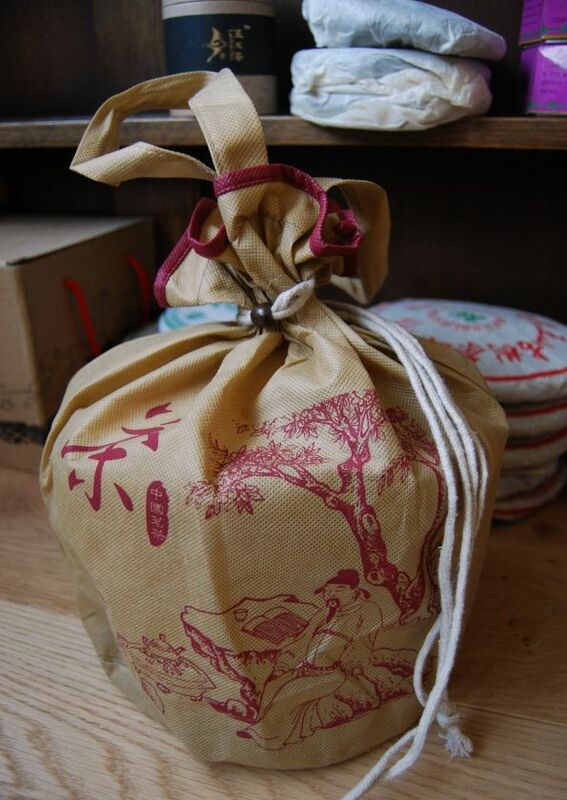 It seems that many of the teas I have been drinking of late carry this same, excellent characteristic. The vibrancy really is as remarkable as that of the 2007 Xizihao Dingji. Somewhere, a while ago, I recall mention of this tea being "flat" - I just don't see that. 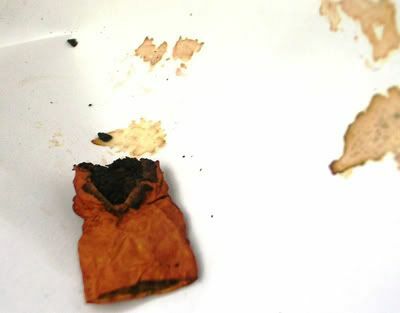 Later infusions carry a lovely tobacco character. Next to the final two infusions, I appear to have written the succinct note: "Decent." Good quality is evident in the wet leaves, but they seem a a bit on the thin side for autumnal produce. Enjoyable, if a bit wacky. Truly vibrant, with an unusual grain-like, mineral character. This is a good pick - thanks again to MA. You have to admit, this tea has a great name. I don't know if "Hong Kong Henry Trading Co." really exists, but if doesn't, it should. Fantastic. This cake is $78 from Houde, where it is noted that the cake sports a neifei in both faces of the bing. I've had the notes for a while, and thanks to DV for reminding me to publish them. Dark brown, with large fragments of leaf. A fair number of tips are visible. 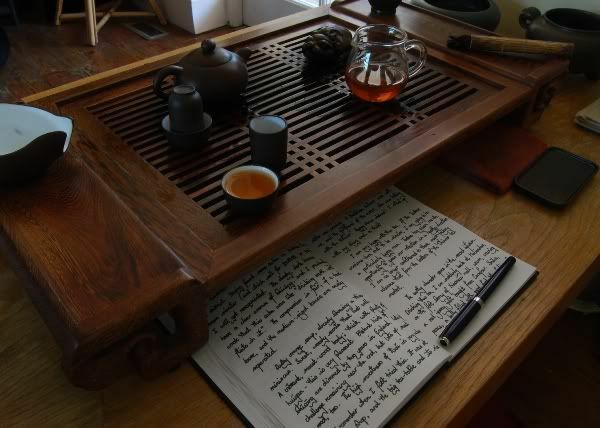 It is sweet wood in aroma, which agrees with Guang's observation of "pinewood". There are some good tobacco notes underneath the main scent. 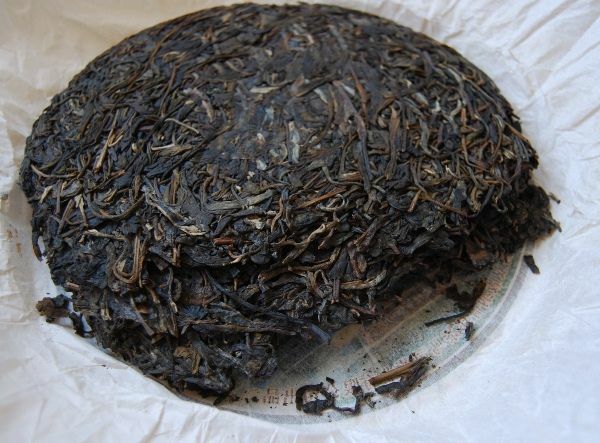 The Houde description draws the similarity between this cake and the aroma of inksticks used in Chinese calligraphy, nicknaming it the "Scholar 7542". Given the brutally acidic nature of this tea, I am inclined to be less complimentary. The soup is lucid orange. 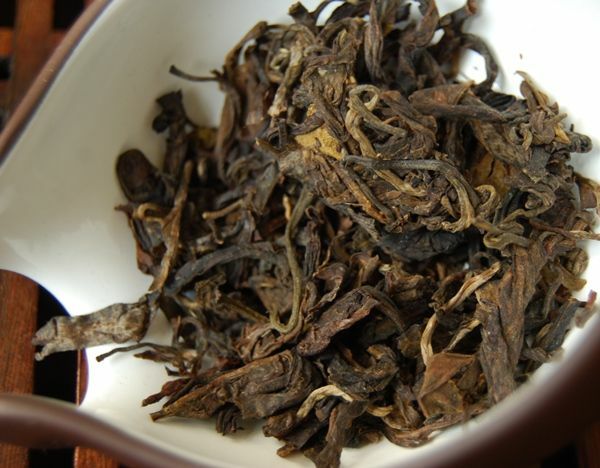 Some initial smokiness fades into a long, rich super-lengxiang of molasss. It lasts forever, dolling out plenty of dark sweetness - really, it is quite remarkable in this aspect. Also remarkable is the aforementioned acidity. There isn't a lot of straight flavour here, as the acidity really dominates the proceedings. The closest I got was the sensation of that dark molasses undercurrent after the swallow. The texture is decent, with a fine coating of light tea-oil on lips and tongue. 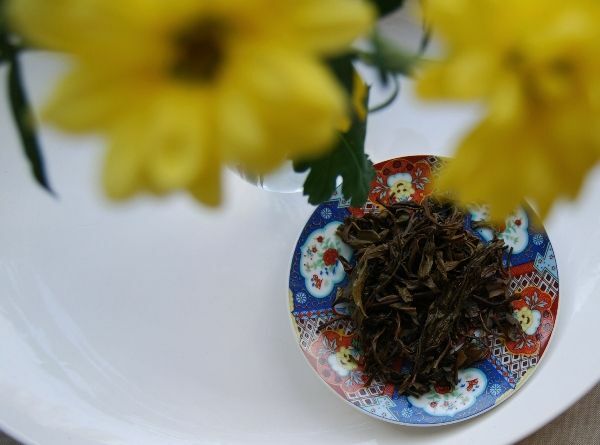 As with the 1985 Yiwu Tuocha and the 2007 Xizihao Dingji, the contact-based energy of this tea is quite special, and leads to that similar numbing sensation wherever contact is made. It settles down into a green, menthol opening, before quickly diving into pure acid in the centre of the tongue, and in the throat. If battery acid were made out of molasses, this is it. "This tea is like drinking earth", notes Lei as she briefly passes through, and indeed the opening flavour in the later infusions does taste like soil suspended in water - prior to the attack of the omnipresent acid. Small and green, the wet leaves are chopped quite deliberately. For me, this isn't quite so much a "Scholar 7542" as much as it is a young waif with a bitter, acidic temper. It is hard to make judgements as to its future given that the majority of the molasses-based flavour is obscured by the acid. I'd like to revisit this in five years. Ouch. Superthanks to HC for providing me with a sample of this tea that I had previously written off, due to its acidity and bitterness during its youth. With some extra years on the clock, has this cake settled down? In 2007, this cake was $78, which seemed a huge amount, at the time. That Houde's proprietor called this a "scholar tea" used to make me weep big tears, but it is now almost a decade old, and perhaps the times they have a-changed. 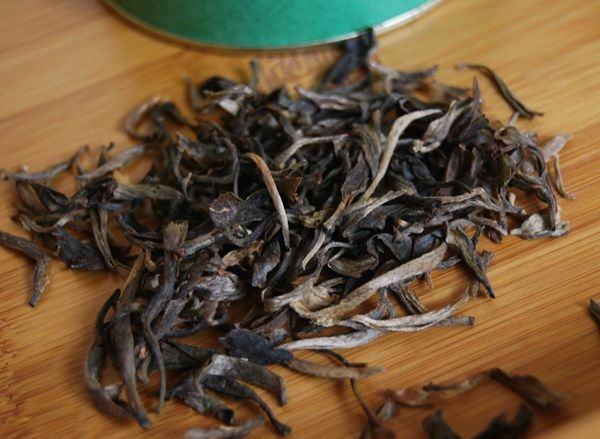 I am reminded that the blend contains plenty of stems and other welcome additions to the mixture, such as the odd huangpian [yellow-flake, the outer leaves that are often discarded by hand], pictured below. Much has happened: this orange-souped little fellow now delivery a sweet, sharp, pinelike cup with an excellent body. The texture is heavy and smooth, a far cry from the rough terror of its immediate youth. The acidity has helped it along the way, and I enjoy the result very much. What pleasant surprises may be in store for those acrid, aggressive cakes... HC has converted me to the delights of this most enjoyable cake, with his generously-provided sample. The infusions march on longer after my capacity to drink them has passed. The future for this cake looks good indeed. 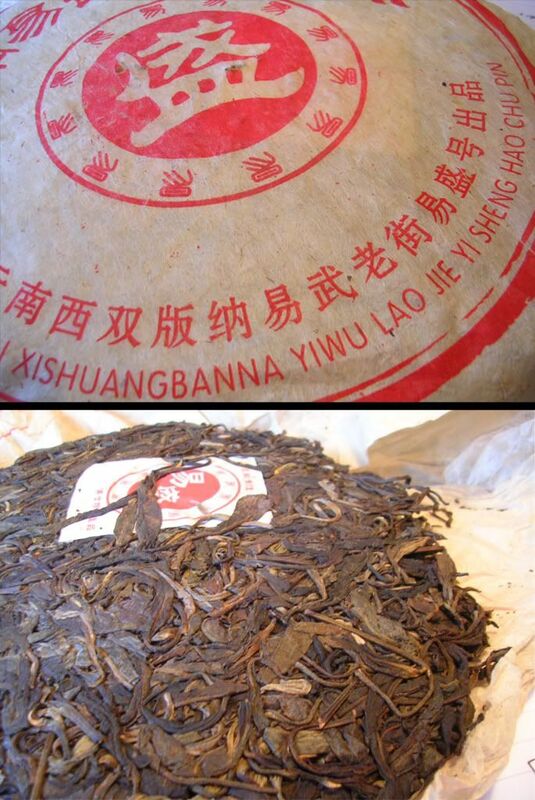 Following the 2006 Changtai "Taipei Expo" bing, here's another tea from the same blender (Mr. Huang) for comparison. I happened to be drinking these on consecutive days, by chance. This one is supposedly a mixture of leaves from Bulang, Nannuo, and Gelanhe (? ), with "some 2006 old plantation Nannuo leaves for sweetness and aftertaste". 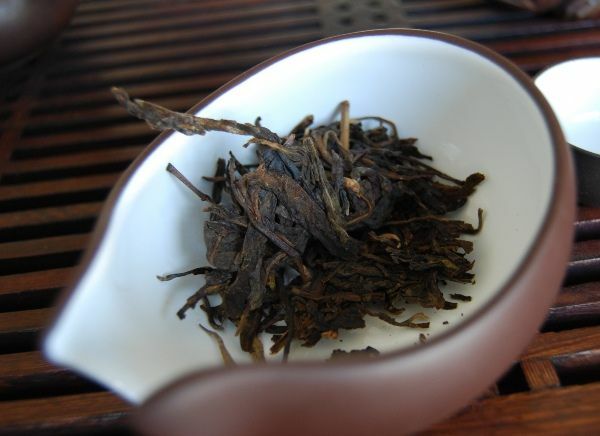 The leaves are dark, fragmented a la Changtai, and have a low tobacco scent that is pleasant but a little weak. I am skeptical of blends being made from quite so many (4!) different types of leaves, and wonder if the weakness of aroma is due to it. Again, as with the previous cake, the soup is a solid orange. Here, the aroma is dark, malty, and sweet. The character is a bit odd: mild grain to open, but swelling towards the back of the mouth into a rolling huigan that leaves the mouth watering excessively for almost a whole minute. This could well be the contribution of the old leaves, as it is quite striking, and seems like a separate component. This tea is particularly, strikingly, cooling in its effect: it has the "post-mintiness" sensation in the mouth, and it leaves the tongue and lips literally cold while the huigan swells. 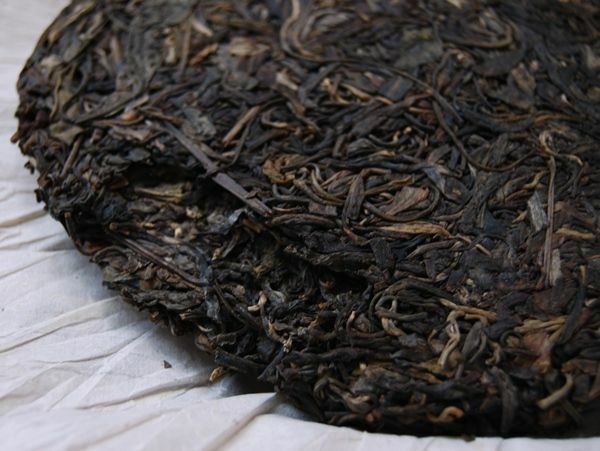 Following the muted wenxiangbei, there is little in the nose except the post-mintiness. Later infusions see the huigan component diminishing, while a more floral component steps forward, accompanied by an increased acidity in the throat. It seems as if the various leaves that make up this mixture have interesting waxing and waning times. By the third infusion, and to the end, the tea has collapsed into bland, slightly acidic fruit juice. At this point, Lei pops in from her lab and gives the following succint second opinion: "Hmm, this is just like drinking kuding. So boring!" The leaves are more whole than the 2006 Taipei Expo, but they are very thin and fragile - bespeaking a certain lack of quality, or at least heavy farming (especially in conjunction with the rather muted, rapidly-diminishing contents of the tea itself). Not one I'll be pursuing further, but interesting for the purposes of education, at least. It's usually frowned upon to write about Zen. So here goes. Every now and again, I read an article about tea in which the author muses, "Aren't we thinking a bit too much about tea? Being a bit too critical?" I recall something similar in the ever-excellent Tea Logic, MarshalN, and Rec.Food.Drink.Tea sites, for example. Maybe most of us that count drinking tea as a hobby have asked ourselves the same question. It's a healthy question to ask, and I'd like to have a crack at addressing it from a Zen viewpoint, with the aid of Joshu's "Drink some tea." One of the tenets of Zen (sorry!) is to try and perceive things "as they are". It's not very easy - Zen folk will tell you it's the hardest thing. Enjoying tea is a great way to practice this, and asking yourself, "Am I thinking a bit too much?" is a good way to begin. Sometimes, like this morning, I sit down with a new tea. I've got lots of questions in my mind: I want to determine its character, perhaps I want to verify the various claims made by the vendor, perhaps I want to decide if it's worth a certain amount of money. Before the tea is even out of the pot, I have a whole headful of assumptions. This happened today. It wasn't until the third infusion that I realised I wasn't really present - I was somewhere else, wondering about leaf regions, growing conditions, and all of the usual paraphernalia. 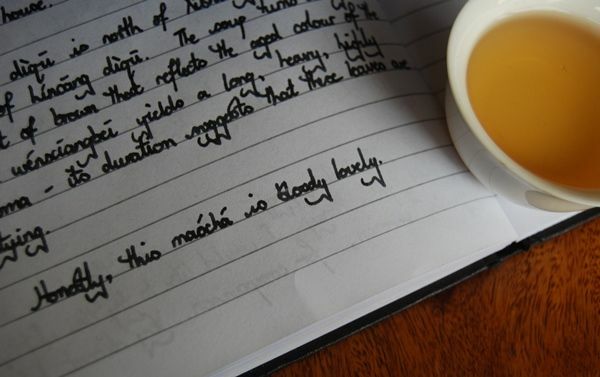 I looked down at the page in my diary, and saw that I had made some observations about huigan, texture, aroma, and so on - but I hadn't really enjoyed the tea. In fact, I couldn't really recall what the tea was like. Wasn't my purpose to enjoy the tea? I sat back on my cushion (I'm a floor-squatting type), and told myself, "Drink some tea." I stopped my ponderings, and simply enjoyed the little steaming cup in front of me. It was a new Xizihao, and enjoyment wasn't very difficult - after I had put away my questions, and my goals. A second relevant Zen tenet (sorry again!) is mushotoku - having no goal. I have a friend who just can't stop trying hard to have fun. He tries so hard to have fun, that in the end he doesn't really have fun at all - and he's quite unhappy about it. Drinking tea was like this for me, this morning. I had so many goals, so much that I wanted to get out of that little cup, that I ended up getting nothing out of it. Until I stopped trying to get things out of it, that is, and then I got a lot out of it. There's a great deal to be said for providing a good analysis of a tea. A solid critique is very useful, and it's one of the main purposes I maintain these articles, of course. However, this morning I resolved not to let that get in the way of "Drink some tea." I always find my most perceptive notes arise when I stop explicitly trying to analyse, and just drink from the cup with an open mind. 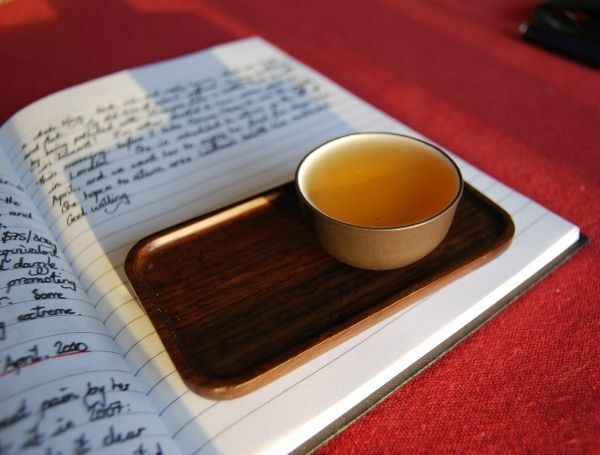 So, it's good Zen practice, but really - it makes for better notes, and better tea. My first xiaoxiaobing! Many thanks to the Davelcorp Foundation for this little fellow. 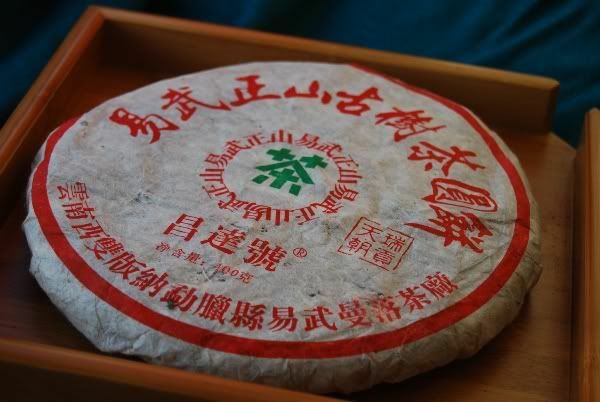 Created by a gentleman that the Houde product pages alternately refer to as "Huang Chuanfeng" and "Huang Chuanfan", this cake was apparently made to recreate the "aroma and flavour of the 50s Hun Yun Tie" bing. This is the first of two cakes I've been drinking blended by this particular chap, entirely by coincidence. As the entire country gears up for the fundamentally British* experience which is this evening's Rugby World Cup final (in which England are playing, no less), today's tea is being consumed against a backdrop of the sounds of the nearby university rugby squads slamming into each other, with accompanying vehement shouting. We say "soccer is a gentleman's sport played by thugs; rugby is a thug's game played by gentlemen". Listening to the screams from the nearby pitch, I'm not entirely convinced about the gentlemanly credentials of some of the players, but at least they're trying. 4 cakes of these sweet little bings, taking the leaf amount up to 400g (and approximately that of a real-sized bing), would cost around £28 / $56 - is it worth it? The dry leaves appear fragmented, but decent: there are plenty of tips to be seen, with some bigger, darker examples. The aroma is really rather good, being sweetly leatherlike, with tobacco. 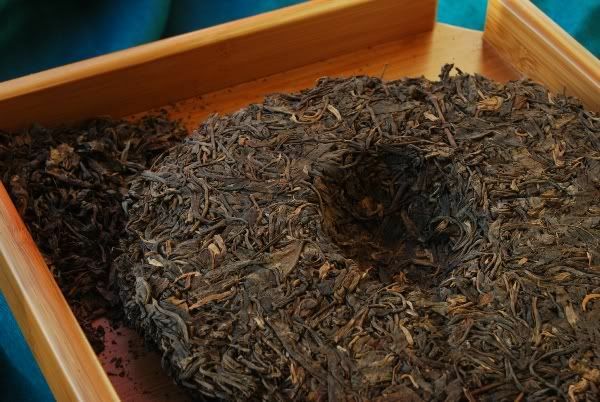 I love tobacco pu'er. 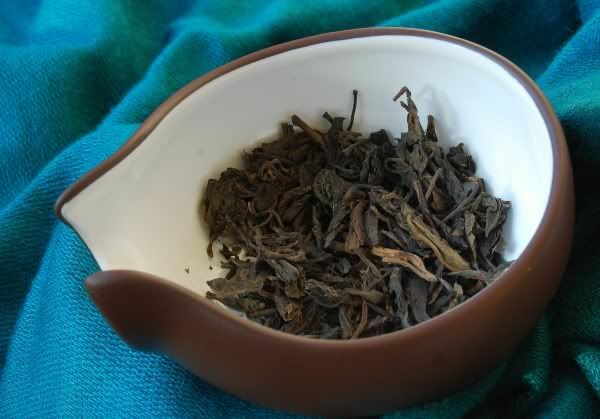 The aroma in the wenxiangbei is sickly sweet, with a hint of green about it - very pleasant it is, too, as with the scent of the dry leaves. The aroma is enduring, also, which bodes well for the performance in the pinmingbei. The soup is solid orange, and is thick in texture. The flavour is up-front, and instantaneous in its presentation of plenty of pleasurable bitterness. 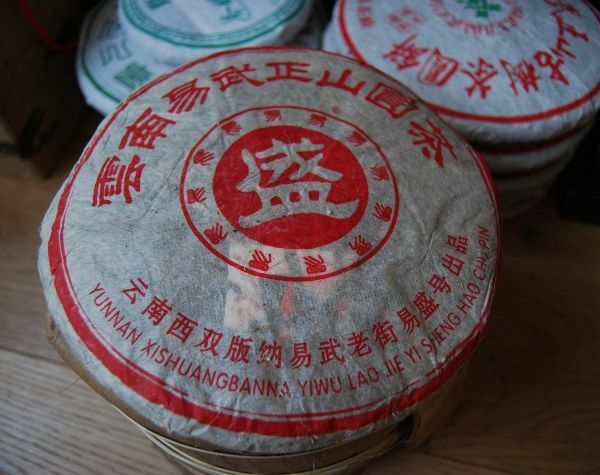 It leads into a pleasant acidity, giving a huigan that endures in line with the wenxiangbei. 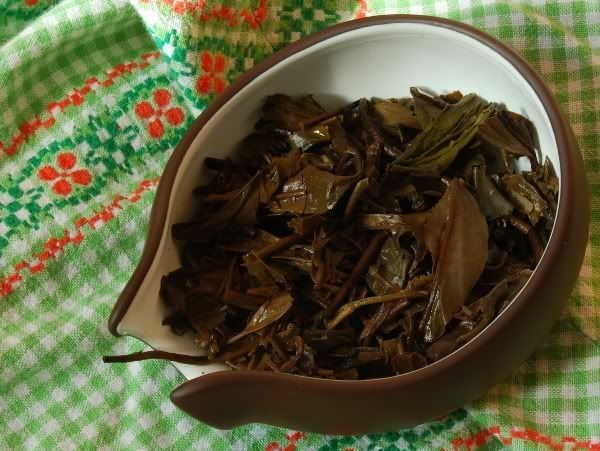 The wet leaves are chopped to high heaven, characteristically for Changtai, containing all grades, and plenty of stalks. Not pretty. 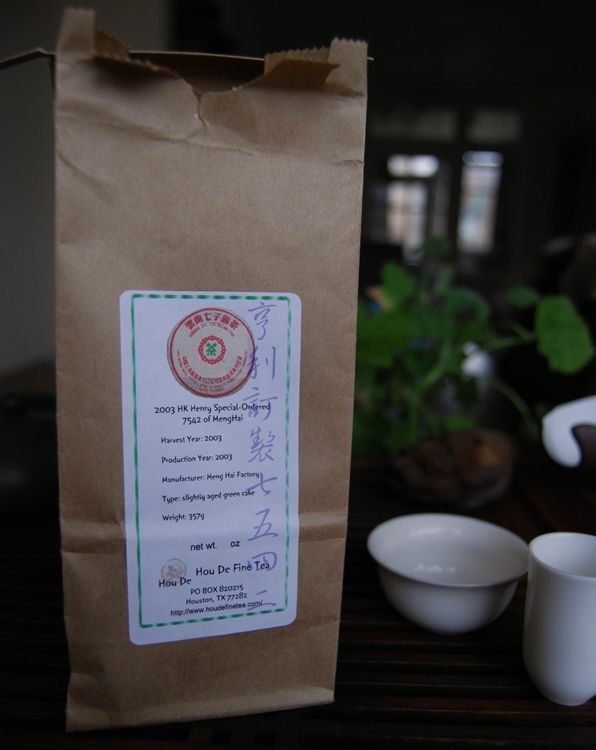 I liked this tea very much: its fresh, interesting character left me pleasantly surprised. A solid "division two" tea at a not-outrageous price. The leaves are quite dark already, and it's only 2 years old at the time of writing. They look dark, fairly whole, and are of decent length. In fact, as I write this from my study, the entire room is filled with the scent of them, as they skulk quietly (but aromatically) in the corner. The scent is unmistakably that of sweet tobacco, which very much appeals to tastes. As it brews, the youth of the leaves becomes clear from the dark, yet clearly green, lid-scent. Interestingly enough, the darkness of the leaves carries through to soup coloured rich orange, right from the outset. The aroma continues forever in the wenxiangbei: burned sugar and that all-pervasive tobacco. The opening taste is something of grain, and dark fruits, before piling on the (pleasant) acidity at the back of the mouth, and leaving an unsurprising surfeit of tobacco in the nose. The acidity folds nicely into a solid, delayed huigan. The spent leaves are not the most beautiful I've seen, but the tip systems are intact, and the texture of the individual leaves is healthy. The character of the tea is very lively, clearing away the cobwebs of sleep as the sky above Magdalen College begins to lighten with the coming dawn. My lips and tongue tingle on contact with the soup, and there is a welcome ku under the tongue. 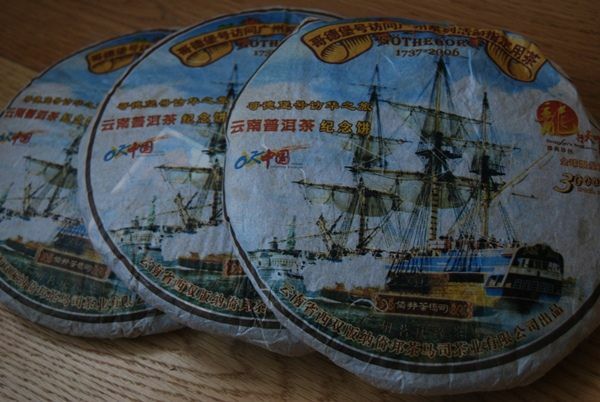 This feels like many of my favourite, tobacco-style shengpu cakes but wound back in time to the era of their youth. Heartily recommended, should opportunity permit. After a further six months of storage, this cake continues to impress. It has good texture, a fine yunxiang of malt, a sweet leather flavour, and a decent huigan. It is darkening rapidly. Three years ago, I spent a summer in Beijing. It was a fun time, with plenty of tea-drinking in between lectures at Qinghua University. Most days, I would catch a taxi from the city's university quarter down south to the (in)famous Maliandao tea district. Guided by maps and e-mails from MarshalN and Bearsbearsbears, it was great fun. I've been back quite a few times since, but still have those maps burned into the back of my mind. 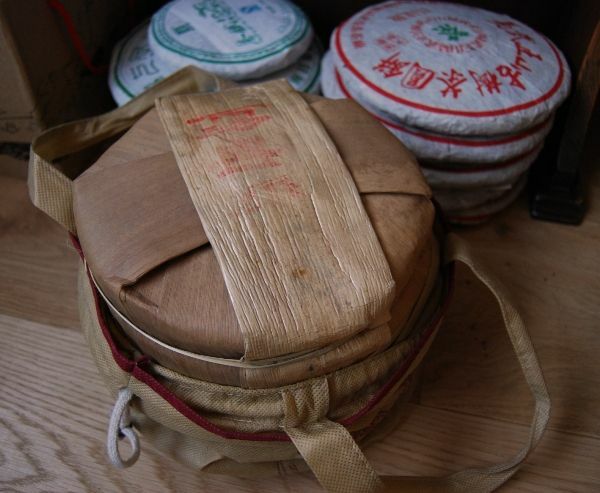 One of the successes of my first visit, three years ago, was this 2005 Yisheng cake. It was recommended by MarshalN, for a very decent price (sub-200 RMB), and I enjoyed drinking it with the collected drinkers in Xiaomei's lovely little shop. Some of my original notes are reproduced above. Since then, I have searched in vain for further cakes to add to my rapidly-dwindling trio of originals. While all of Xiaomei's other cakes have turned up on Taobao in various places, this Yisheng has not. Being the finest of all my Maliandao cakes, it has been a recurring theme in my on-line treasure-hunts. This year, during our Christmas visit to Lei's family, we called in at Xiaomei's shop. Though the owner of the shop was not present herself, Little Brother was ably standing in - three years older, and three years wiser than before. He has turned into a professional tea-seller in his own right, and is a pleasure to drink with. Inevitably, the conversation eventually came around to the mystical 2005 Yisheng. Little Brother remarked that it was Xiaomei's favourite cake for recommending to folk that are after younger pu'er. The asking price was over 3.5x the price at which I originally bought it, which is testament both to the amount of increase that a good cake can command in three years, and to MarshalN's ability to obtain close-to-wholesale prices in his dealing with Xiaomei (my original cakes were priced at around 10% over wholesale price, thanks to MarshalN). Could we have a tong at the original price, we ventured? Little Brother grinned. He tried, and failed, to call his Big Sister for approval three times. We quietly continued drinking the tea. Eventually, he put down his telephone and took the decision himself, in our favour. I felt particularly guilty. Though not too guilty to take a whole tong at that price, of course. It is both a delight and a relief to have a tong of this tea, finally, back with us at home. 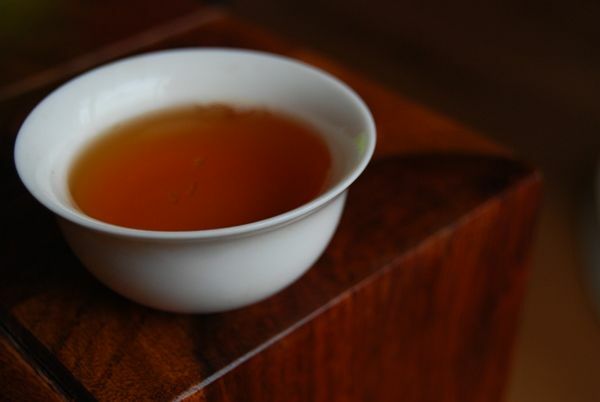 It tastes like a young version of an old tea, such is its elegance in aging. 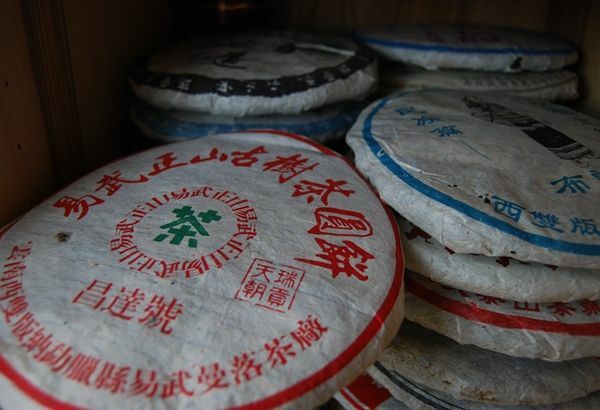 I am one of those stubborn types that heeds the call of pre-2006 pu'er, and Xiaomei's favourite, MarshalN's recommendation, and my own tastings have confirmed my love of this 2005 Yisheng. Do keep the name in the back of your mind should you happen across it somewhere, or another from the same producer, as it is very much worth the time taken to try some. Edit: this tea was seemingly made by the Yiwuzhengshan Tea. Co., also makers of Douji, back before the company stabilised its output (and its factory name!). 2005 Yiwu Manluo - Changdahao "Yiwu Zhengshan"
A wise man (Davelcorp) once said that the common thread linking the enjoyment of pu'er, cigars, and single-malt Scotch whisky is the appreciation of earth and dirt. These sagacious words were resounding in my mind from the minute that I had my first sip of this cake, at Xiaomei's shop in Maliandao. If it's clear from the accompanying photographs, this cake looks like dirt, literally. It appears to be matt and somewhat, well, dirt-like. The aroma is dusty, and the flavour is very much like drinking earth with flints in it. Somehow, this unlikely series of characteristics make for a rather winning cake. 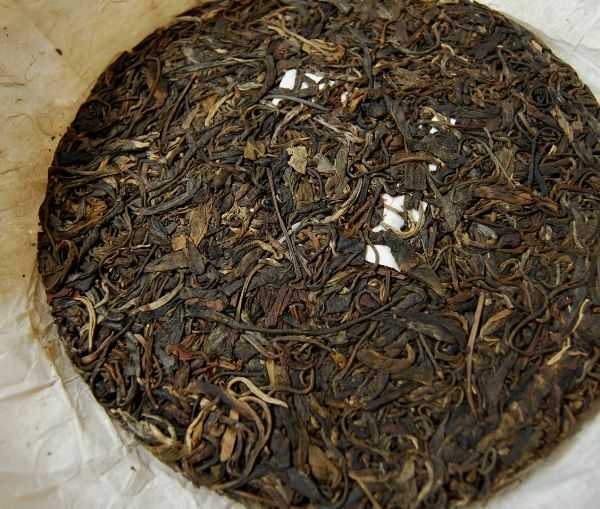 It's from the Manluo Tea Company, which is somewhere near Mengla mountain. I recall it costing something around the 200-300 RMB mark [£14-21, $28-42]. The leaves are chunky and dark, and the smell is pleasantly on its way to being aged. I've enjoyed this cake on a number of occasions since my return, but today I had the pleasure of sharing it with Lei, so that these notes can have the benefit of a second opinion (and one not biased by the fact that I paid for it). The soup itself is very energetic, causing a lovely buzzing on the lips, and on the tongue - something I have come to associate with good tea of all ages. Soon, the inevitable: "This tastes like drinking soil. In a good way." Combined with the immediate earthiness (which is very appealing, happily enough), it has a mineral, alkaline character at the back which Lei likens to that from Gorgonzola cheese. In concert with this, it is tangy, and gives a long, tantalising huigan. It brews a rich amber colour, and has a very sweet aroma. This is the part where it most seems like a Yiwu, before departing for earth-and-flint territory. The wet leaves can be seen to be large, but quite untidy - and there are plenty of sections of pure stalk mixed in, which rather reminds me of the modern Taiwanese cakes that we've been encountering. The leaves are healthy, and robust, at least. Overall, it's a fine tea. It doesn't evolve much, however, staying well within its earthy, mineral limits - but that's fine by me, and, apparently, by Lei too. Good stuff. It's been a long time since I visited this cake. I've recently found it for sale on Taobao for approximately the same price as I bought in Maliandao, from a friend of MarshalN, two years ago, and so it's time to get reacquainted. The leaves are still dark and dusty - no surprise there, given that this is a solid shicang [SHER-TSANG, wet store] cake. The compression is fair, if a touch loose, and the leaves come away easily enough without being damaged. Pictured below, you can see how easily the leaves come away from the cake. The wrapper alone holds lots of shrapnel, some of which I take for my session, and the remainder of which goes into my "lucky dip" container of mixed-up leftover leaves, for drinking another day. This is a particularly interesting cake, because it's one of the biggest-leaf shicang examples that I have. As you can see below, there are some proper-sized leaves in this cake. Chopped blends can be fine, and I enjoy them as much as the next man, but there's a special place in my heart for good-looking, whole leaves. Drinking this tea, I am taken back to Maliandao, on the first storey of the mall that hold's Xiaomei's shop. It's a very warm day, and I'm taking the day away from lectures at Qinghua, a large university in the northwest of the city. Sitting in Xiaomei's shop, I joined an old, retired lecturer in Buddhist Studies, Xiaomei and her sister, and the owner of the shop, visiting from another city with his girlfriend. When I arrived, they were all drinking this. When I left, I had a few cakes in my bag and a belly full of good tea. It has a vibrant body filled with sweet wood, which is thick and full. The huigan is very solid, and gives plenty of room for pause. The distant hints of shicang have, I believe, been somewhat attenuated following its two years of dryer storage in England. This is falls into one of my favourite age-brackets for pu'er: that edgy territory between youth and maturity. 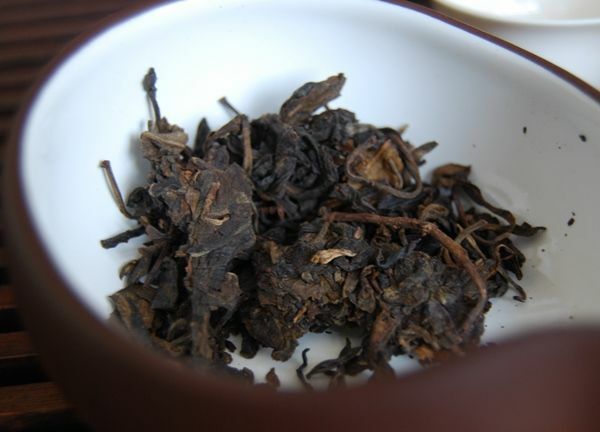 It has a little of both genres, but belongs to neither, containing plenty of kuwei [pleasant bitter taste] from its youth, but also plenty of woodiness from its age. 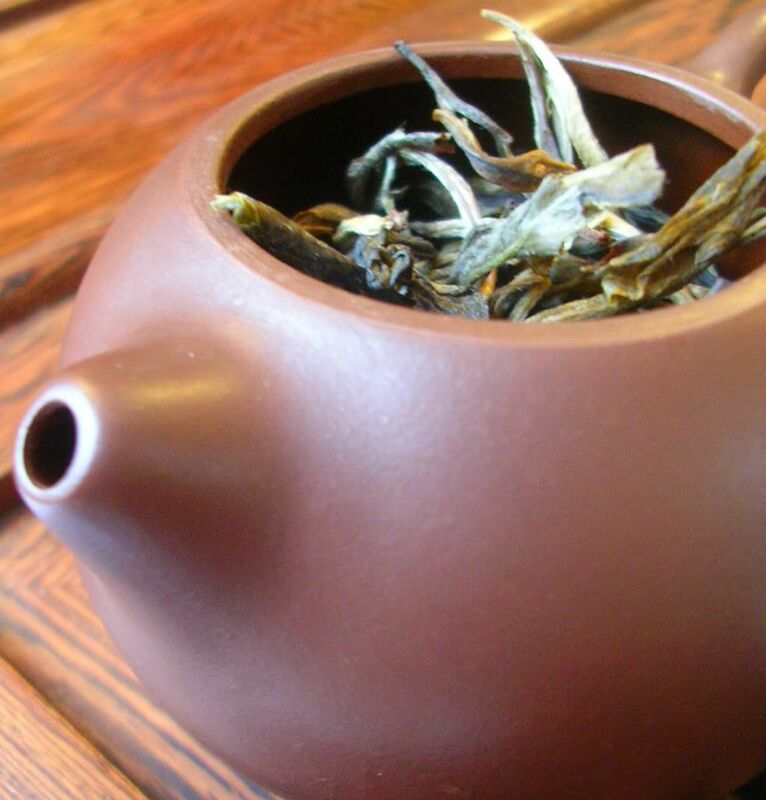 The high sweetness of Yiwu is very welcome. I originally wrote that this was like "drinking earth with flints in it", the latter being the mineral-like character that I use to describe some types of shicang. If anything, it has become sweeter, and more interesting. If the Taobao cakes turn out to be even slightly similar to this one, I will consider myself a happy man. I've bought the same cake from several different vendors, with prices ranging around the RMB 200 mark ($29). Can you spot the odd-one-out? Happily, all of these cakes seem to be very close to my original cakes, which is a relief. This also means that I probably don't have to buy any more after this experiment, as I have a little more than a tong remaining. The packaging was similarly good from all vendors, and the cakes arrived undamaged. As before, the leaves are very decent - quite whole, and easily separated. This is a reedy, yellow-wood tea that I enjoy very much. The "earth with flints in it" feeling is also present in these recently-acquired cakes. Presumably, these cakes have been in various types of storage, scattered around Beijing, Shanghai, and Guangdong, but they all taste rather similar. I can thoroughly recommend them. Yet again, Xiaomei proves that she can pick mighty fine tea. Many thanks to Apache for this addition to the family: a 2005 Changdahao. This is a beautiful cake. I am very happy with its price, compared with its quality. Perhaps it is one of the cakes that plays to my idiosyncrasies, but I thoroughly enjoy it. Breaking open the cake reveals a quiet shicang [wet store] aroma, which is to say that it is the scent of humid air - I'm sure this hasn't actually been in a dedicated wet-storehouse. The leaves look very clean, as shown below. A little shicang goes a long way, and I rather approve of a touch of humidity in the storage. The soup is a clean, rusty-orange fluid, and it carries the aroma of humidity from its leaves. As with my own version of this cake, it has a pleasing metallic flavour - low and broad, and then penetrating under the tongue. Slightly tangy, pleasantly solid in its body - I am reminded why I have had such enduring feelings for this simple, yet lovely, little tea ever since buying some from Xiaomei. Thanks again to Apache. Teas brewed for me in Maliandao generally tasted about 50% as pleasant as the same teas turned out when brewed at home. This particular tea, the 2007 Simao maocha, makes for a good comparison of waters, as I have tried it in several locations: Maliandao, a Beijing hotel, in my office, and at home - with water quality increasing from worst to best in that order (Maliandao worst, home best). 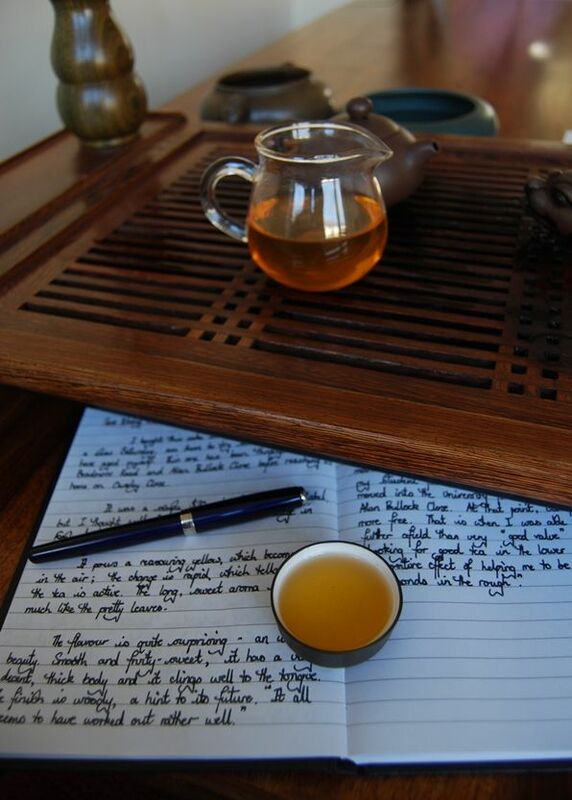 For the insular purposes of my notes, this tea was 120 RMB [~£9, $18] per banjin [250g], from the sweet girl who spoke no English, and whose boyfriend was cooking dinner. Good, whole leaves with plenty of tips, which give a correspondingly grape-like, green lid. 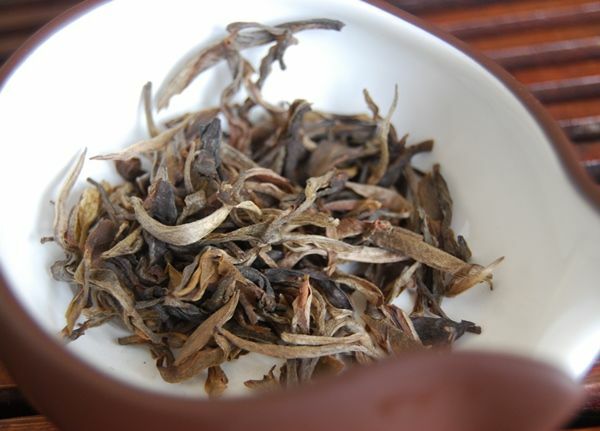 The wenxiangbei gives a tangy, mushroom-like aroma, which exactly follows into the mouth. There is plenty of exciting acidity in the finish, from which comes the huigan, while the texture is almost creamy. The soup is a solid yellow. 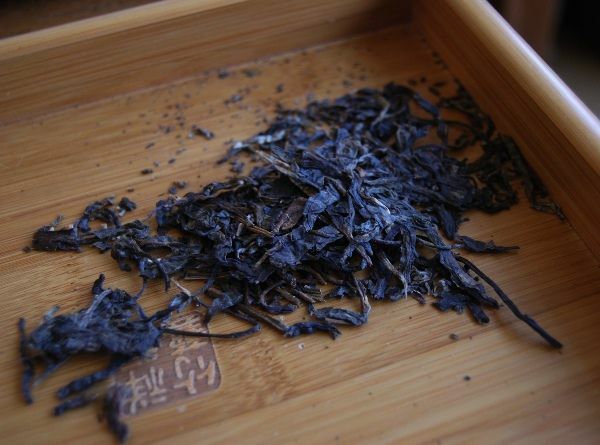 It's a chunky, mushroom-like tea which I like very much - one for drinking immediately, with plenty of leaf. The wet leaves are all tip-and-bud systems, with good strength that suggests the effects of overfarming may not be omnipresent. A fine grade. Its effect with water is fascinating: this is a very decent tea, but I distinctly remember how it tasted in Maliandao: an echo of its future glory, but standing out enough from its Maliandao peers to encourage me to buy it. All other brewing parameters being almost identical to my own, it has to be the water that is the differing factor. Using a similarly poor-quality water in my office almost exactly reproduced the pedestrian Maliandao character, while giving it the benefit of some decent water (Scottish Mountain) at home was like polishing a grubby diamond: the results were brilliant, fresh, and thoroughly enjoyable. This seems to be a constant tale for my Maliandao teas: they taste delicious at home. An education in water, again. 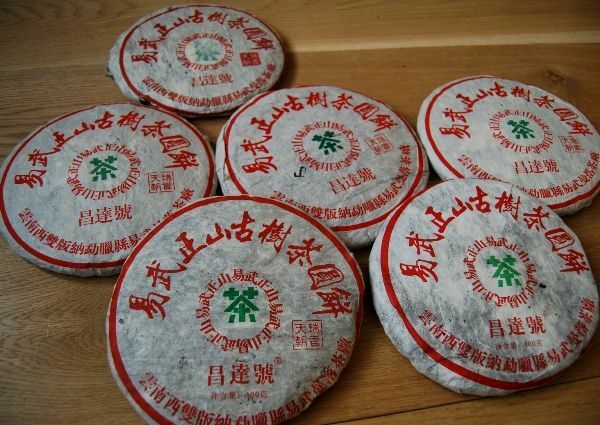 It has been five years since I bought and last tried this maocha - I have been aging this maocha in a tightly-sealed cardboard tube (pictured below), and a smaller amount in a rosewood box so that the majority in the tube need not be disturbed. 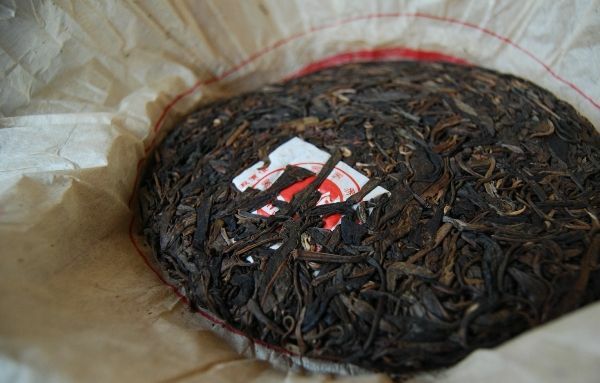 As it turns out, the rosewood container imparted some rosewood charateristics to the 50g or so of maocha that it contained. I consumed this in my lab, but wondered as to the majority of the leaves, aging steadily in their cardboard tube. 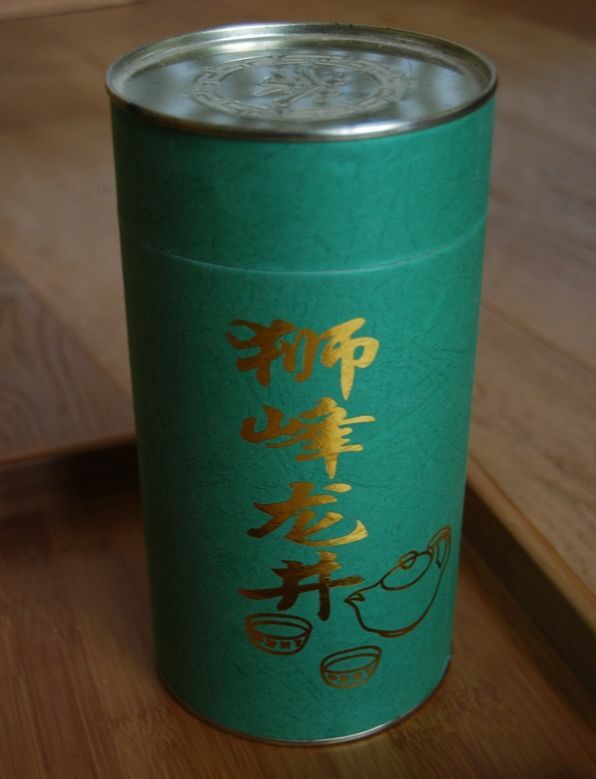 The immediate impression is of a maocha that has darkened considerably in the half-decade that it's been aging here in England. The green character that I remember from before has been entirely replaced by a healthy brown shade. I'm amazed that I seem to recall the taste-memory of this maocha, even though it has been five years since I encountered it last. Simao prefecture is directly north of Xishuangbanna, and south of Lincang. Its produce seems, to my recollection, to be more akin to the latter than the former: rustic, "granary", sweet, potent. The aroma, uncaged after its years in isolation, brings this back to mind. Even though the cardboard tube has been closed for five years, the tea has aged noticeably. I deliberately keep my maocha stoerd under more tightly-constrained conditions of airflow than my cakes, because I (rightly or wrongly) associate loose leaves as being at risk of losing their character. Many's the aged maocha that I've tried that seems a touch spent, whereas the density of matter in a cake seems to age more robustly. As shown in the picture above, I rather enjoyed this maocha. Despite being almost sealed, the soup has darkened from the acrid green-yellow purity of youth to a heavy orange. In the aroma cup, it is long, sweet, and potent - a great sign. Vibrant, mouthwatering, tantalising - the 2007 version of me really managed to buy a good tea in this instance. It is like a gift from the past, and a highly encouraging episode. Its kuwei [good bitterness] remains strong, but it has broadened and deepened in its character to become richer and more enjoyable than the leafy green flavour of youth. Fantastic stuff. Back in the tube it goes. 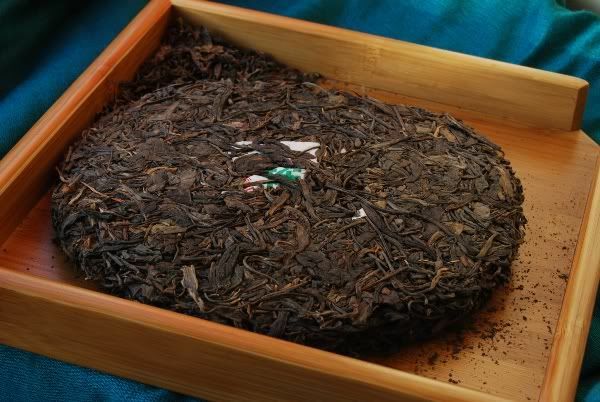 The scent of the leaves remains that of the rosewood box in which they are stored, but the wenxiangbei is filled with sweet-and-granary Simao aroma. The brown tint to the soup is a further clue to its origin. I enjoy its "soft" and smooth flavour; its age has taken away any rough edges that it may have had. Is that pesticide? Long-term victims of the Half-Dipper might recall an article on the 2006 Yibang Chamasi "Menghai" cake. It was highly inexpensive, and performed above expectation. This cake, the Gedebaohao [Goteburg brand], is one I have been meaning to try ever since then, courtesy of a recommendation from Geraldo. Very nice indeed, being long and whole. For an inexpensive cake ($20 from Royal Pu'er), they look decent. There is a range of colours on display, from red, to brown, to various shades of green. There is a grape-like scent of maofeng about them. 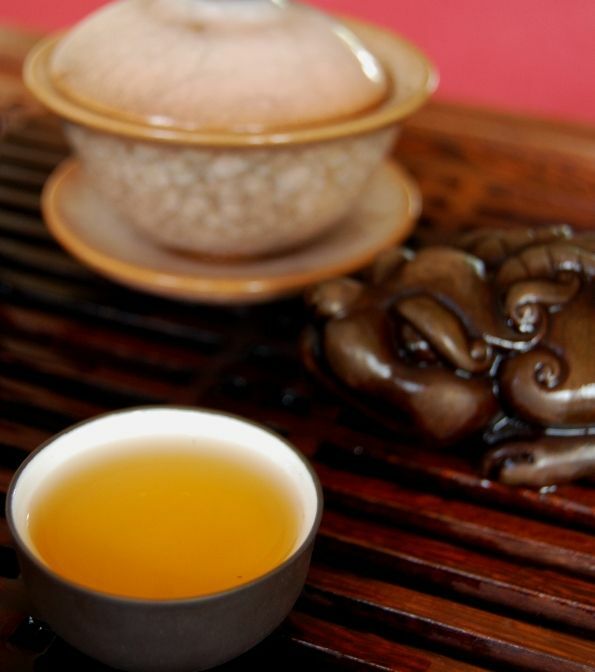 Green tea aromas usually arouse suspicion. The initial lid-scent is quite sour. The soup is a straight orange, of average clarity. The beidixiang is a very quiet sweet grassiness, with a sweet-sour lengxiang, akin to the lid-scent. This leaves me uncertain of what to expect from the pinmingbei. 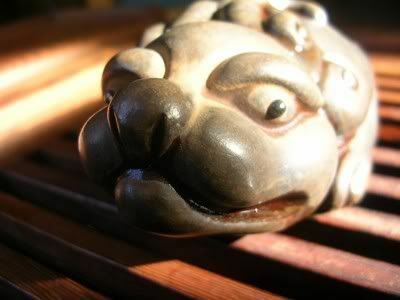 The character is unusual indeed: it is low, like a dark Chinese medicine, but with a fresh mushroom character. 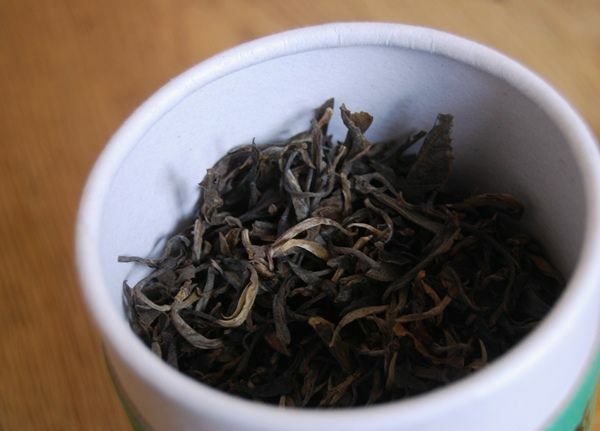 The tea is tingling and active on the lips and tongue, and the texture is fair. A direct, but not overpowering, ku swells to a fair huigan, that leaves the mouth watering. The chaqi is noticeable in strength, at least. This tea has to be shown a strong hand, as it becomes underpowered if the infusions are not repeatedly and significantly increased in duration. Right to the end, it remains buzzing and active in contact with the lips and tongue. Fairly whole, and small-to-medium in size. They are a touch thin, but nothing too serious. Active, quite smooth, with that pleasant, swelling huigan. It is a "second division" tea, but doesn't make any claims to be otherwise, at $20. For the money, I like it. I was hoping to be thrilled into buying a tong, but instead, I am mildly amused enough to have bought three cakes. This tea tasted fresh, pleasant, and exhibited a decent acidic aftertaste that left me satisfied. While not the most complex tea in the world, it gave me a solid mix of broad flavour, coupled with a particularly enduring aroma. One year later and this tea is coming on nicely. It is dark - even darker than in the photograph above. The soup is orange, and the flavour is a decent mix of smooth straw-like characteristics, with an aftertaste of tobacco. It has some potency, and hints of redness are beginning to show in its blend. I'm very pleased with the manner in which this is aging. This trio of cakes has been with me for four years now, and the cakes themselves are just about to celebrate their fifth birthday. They were cheap and very cheerful when I bought them, but their significance is that I have tried them most years since buying them. Due to the pressures of time, I can't drink all of my tea all of the time, and so this cake, in particular, is a very useful indicator of the effect of English storage. It was a simple $20 cake from a minor label, but I thought well of it at the time. My notes above remind me that I have enjoyed its limited charms each time that I return to it. For a small-label, somewhat mainstream cake, it has a "hand-produced", artisan feel to it. The compression is loose, and the leaves are mostly whole and well-preserved. The whole cake has a rich, heavy aroma of woody leaves; it has positively increased in character and potency. My expectations are low, but hopeful, as I sit down on a slow Saturday morning. It pours a solid orange colour, which darkens rapidly in contact with the air, as if it is alive and well. All of the laoshu cakes that I have tried exhibit this evidence of activity, and so I take it to be a good sign that the cake has not died, and become flat. The character in the mouth is genuinely surprising - an unexpected beauty, all of a sudden. Its body is thick, and it grips the tongue well; the effect is sweet and clean. 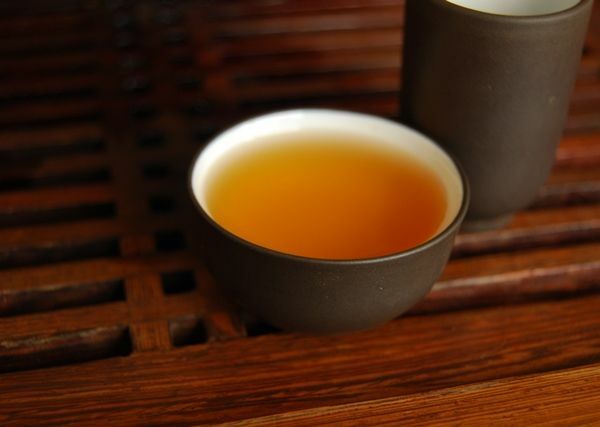 In the throat, a resounding woodiness - the tea has aged surprisingly well, and is developing into something significantly different from its original mushroom-and-straw origins. Encouraged as to the efficacy of English storage, I spend several hours with this new-found gem. It was a solid tea at its beginning, but time has been kind to it. I feel some relief as I look over the stacks of tong after tong, every little such experiment heartening me to a small, but significant, degree. 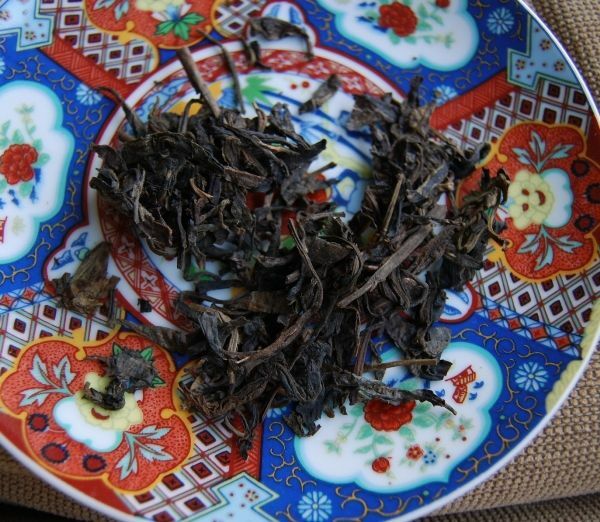 2007 Guoyan "Phoenix of Yiwu"
Thanks to the tasters for all of the notes, and thanks again to Gordon at the Dragon Teahouse for being so good as to provide the tea, and go the considerable trouble of posting the samples. An extra special award for service above and beyond the call of duty goes to Doddy for managing to match each tea with a different comic book! Clicking on the links above should take you to the notes for each tea. 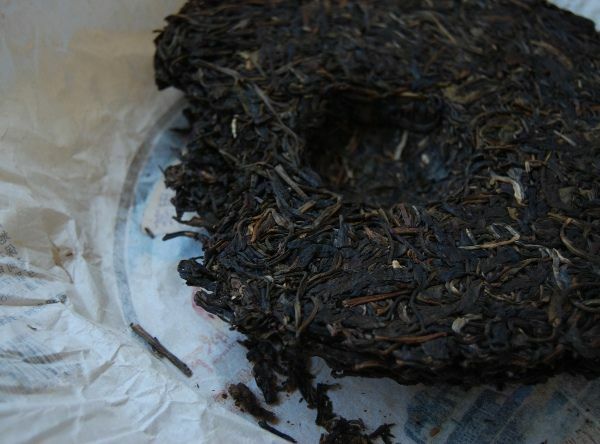 For completeness, see also notes on the 2007 Guoyan "Phoenix of Yiwu" at Tea Logic, and Ancient Tea Horse Road.